While passing by this site during one of our journeys, an ASI board directing towards the Dolmen circle site caught our eye, however, due to lack of time we couldn't make it and the name was included in our to-visit list. After prolonged postponement, during our recent road trip, we made sure we visit this intriguing site of dolmen circles. As we were already aware of its location, we reached the village of Doddamalathe, located off the Somwarpet - Shanivarsanthe state highway only to realize that we were familiar with the surroundings of this megalithic site, as we had visited the famous pilgrim center of Honamma temple situated very close-by to the site( Read here). The two hills here are named Gavi Betta and Morey Betta. While the former is quite popular among pilgrims, the latter is a megalithic site. We inquired about the route of Morey Betta and a few confirmations here and there lead us to the hill base of Morey Betta. As none were present in the hill surroundings, we had to explore the right route to the site and wasting no time, we went ahead. Fortunately, we climbed the hill in the right direction and very curiously looked forward at each and every step to see if the dolmens were visible. The dense grassland blocked our vision and after climbing a certain distance we reached the megalithic site. With great excitement, we walked ahead. An incomplete barbed wire fencing around the circumference of the site ensured against trespassers and taking the right entrance. We sighted a number of Dolmen circles or cairn circles at the site, out of which some being undisturbed by external elements stood in a good shape while the others were in a disturbed state. However, the Dolmen circles here are quite intriguing. Locally known as 'Pandavara Gudi', owing to a popular belief that these structures were constructed during the period of Mahabharata (the epic war of kurukshethra between the Kauravas and the Pandavas), these Dolmen structures are commonly associated with Pandavas across Karnataka, except in a few places. We were able to identify two types of Dolmen circles here. The first type and the most common of all consists of small sized stones arranged in the form of concentric circles (around 2 to 4 in number) with the dolmen placed at the centre. The second type consisted of big standing stones or Menhirs around the first circle of stones followed by smaller ones around the other circle. The former may have been that of common men while the latter may have been the ones of important people such as that of a king, a leader or their peers. The Dolmen typically had four vertical stone slabs with a big cap stone placed over them, with one of the vertical slabs housing a port hole. Some of them resembled anthropomorphic figures. 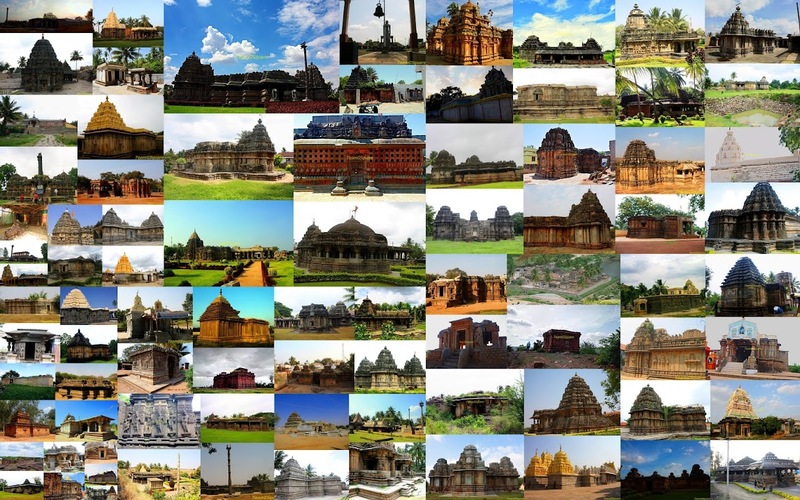 According to R A Cole (the then Superintendent captain of Coorg), these structures may have served as Altars or temples. Further investigations conducted by R A Cole and his team revealed pottery of miniature sizes, similar in shape to those found in the other Coorg cists. It also revealed an interesting gold coated copper disc, though the coating had peeled off in some places. This megalithic site is almost 3000 years old and has survived against all odds. Another interesting story associated with this place is that when people dug a basin for a lake (presently the Honnammana kere), no water was encountered and water came in abundance only post human sacrifices to the goddess. These burials of the dead formed the Pandavara Gudi. This theory is far from being the fact but this place needs some kind of restoration and maintenance. Though the ASI website mentions of two dolmen circle sites here, namely Doddamalathe and Sulimalathe, the locals confirmed that the two together form one site. The megalithic site being surrounded by both the villages of Doddamalathe and Sulimalathe around its periphery, it falsely seems as though there are two different sites.